The middle of the work week: commonly known as Wednesday, popularly known as Hump Day. But at Seton Hall University, this day of the week is locally known as Free Coffee Wednesday. 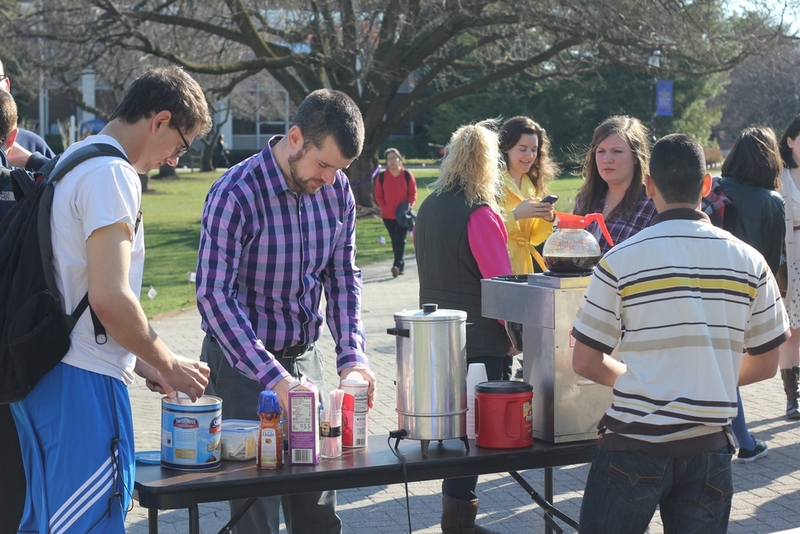 Students from Saint Paul's Outreach set up a table in the middle of campus and hand out free coffee, tea and hot cocoa every Wednesday morning to students and faculty on their way to class. It's a great opportunity to brighten someone's day and—if the customers have time to stay and chat—a great way to meet new people. Whether it's raining, snowing, melting heat or sub-zero temps, nothing stops Free Coffee Wednesday. And as the weather gets warmer, even the Frisbee makes an appearance. @TheMochnacz: FREE COFFEE WEDNESDAY! Best way to get over the hump!